Alex M Adamson LLP was awarded an Investors In People Gold Award in 2016 as a result of the advanced people management skills displayed in the business. Attaining an Investors In People award ensures your company is amongst the very best in the global industry when it comes to leading, supporting and managing people for sustained success. Investors In People’s recent assessment suggests that leadership within AMA is continuing to strengthen. 90% of our employees fully trust company leaders and they value management’s openness with company information which confirms their position as trusted, genuine leaders with values of fairness and transparency. Over 80% of employees consider our leaders to also be motivational. The way we are empowering employees is improving, with staff feeling that their “opinions matter”. There is also recognition by the team that many decisions involve judgment; which empowers our employees to ask each other for advice all the time, knowing they will be supported even though they may take a different decision. From the Investors In People on-line staff assessment it has been established that AMA are getting even better at encouraging high performance, setting objectives and reviewing how employees are performing against them. We ensure everyone has targets that they can monitor on the system and tailor these in order to be realistic in understanding that staff members work is highly variable. One of AMA’s clear goals is to grow the skills and capabilities of our people. Investors In People found that our staff find our training to be highly interactive and an on-going process, with one employee stating it is “almost an everyday activity”. Staff found both formal and informal training is readily available without question to those that need it & that management are open to draw on examples of their own experience to help staff members grow. Our team also feel that the latest improvements of our systems better their working lives as the systems are now faster and easier to use. AMA are continuously striving to be leaders technologically in the industry, and our employees also value this commitment and look forward to a more digitally led work environment. 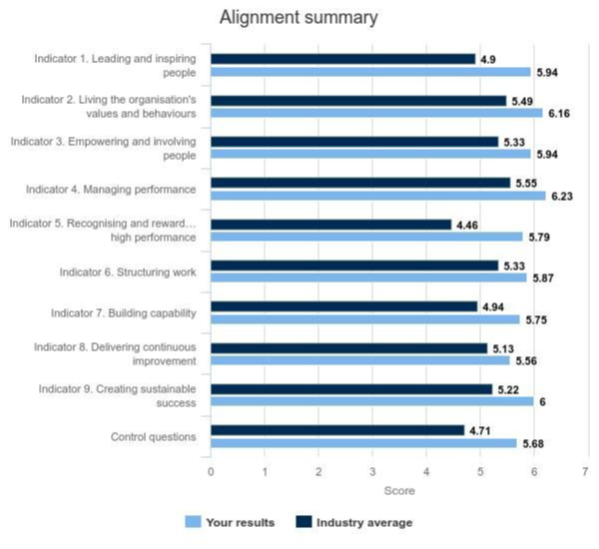 A key section of the IIP review is assessing a company’s people management efforts and comparing them to the average performance within the industry. The table below summarises Alex M Adamson’s 2017 ratings compared with a broad group of companies within our professional sector. It can be seen here that AMA have continued to surpass the industry standards in each category. Providing good leadership and a supportive environment for our team is something that is deeply embedded in our vision and values. We look forward to continuing to receive the benefits of continual assessment from IIP over the next review period in order to provide the best people management standards possible at Alex M Adamson.